Blind Spot: A Matter of Perception featured ten abstract paintings from the Massillon Museum collection, each translated into sonic iPad touch screen apps and tactile models. 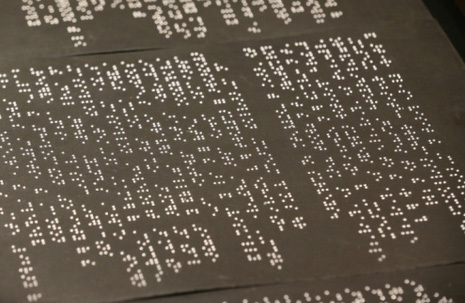 Typewritten and braille labels, produced by Clovernook Center for the Blind and Visually Impaired, enhanced the experience. Blind Spot: A Matter of Perception, presents ten abstract paintings from the Massillon Museum collection, representing regionally-, nationally-, and internationally-recognized artists. These paintings are made accessible to patrons with blindness or low vision for the first time, through multisensory experience. Following conversations with the Massillon Museum curator, sounds in the sonic iPad touch-screen apps that accompany each painting were selected by co-curators Barry and Jan Stirbens of Stark County, Ohio, who have both been blind since birth. 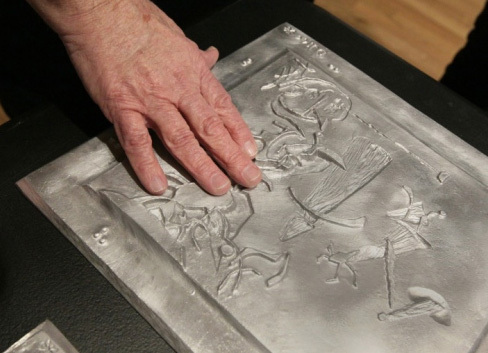 Braille and large-type labels, as well as small-scale aluminum tactile models of each painting, help to experience the artworks through multiple senses. 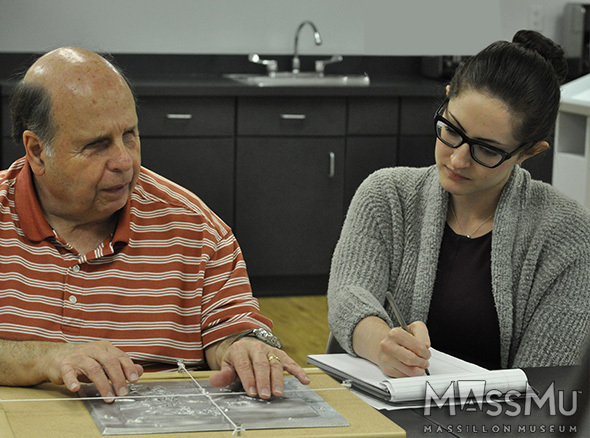 Blind Spot co-curator Barry Stirbens tests aluminum tactile models while MassMu Curator Heather Haden takes notes on his responses. 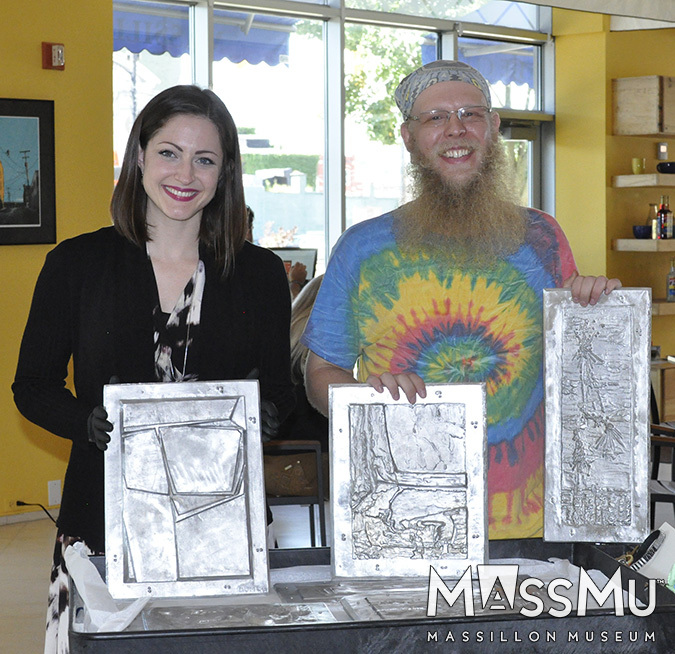 Curator Heather Haden and artist David McDowell show off the aluminum tactile models. This exhibition seeks to make these selected artworks accessible to all patrons. To the left of each original artwork is an immersive, experiential station, including the following interactive elements, in order: large-type and braille artwork labels, produced by Clovernook Center for the Blind and Visually Impaired; a tactile model of the artwork created by artist David McDowell; an iPad app with headphones, designed by Classic Interactions LLC, to explore the painting through multiple senses; tactile ceramic artworks created by students and staff at Clovernook Center for the Blind and Visually Impaired in response to the tactile models and apps; and a tactile gallery map. 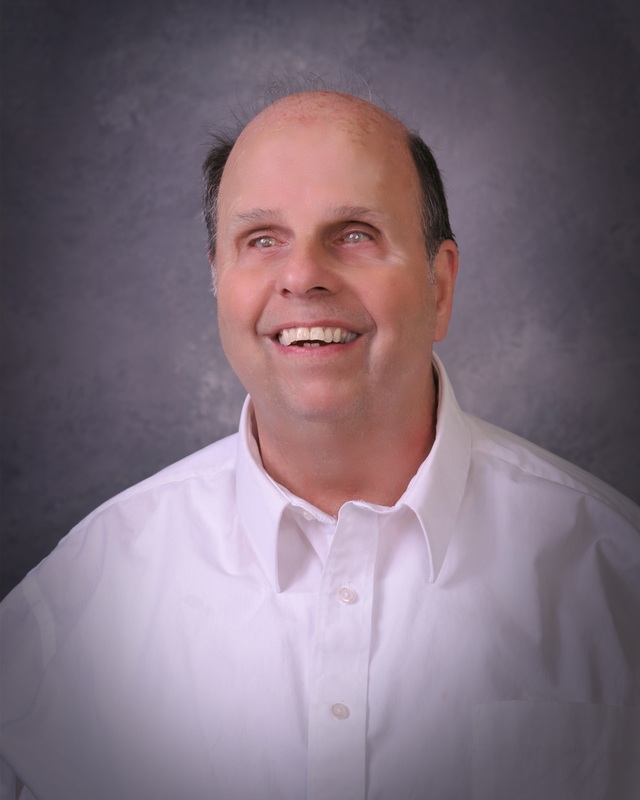 While many patrons with blindness or low vision use Apple Voice Over accessibility settings, the apps have been designed intuitively with on-screen commands that enable the widest possible audience to interact with them. High-contrast borders around each original painting enable greater access to patrons with low vision, and carpets in front of each station assist patrons using canes to easily locate interactive components. Sighted patrons can experience the art from a different vantage point by borrowing macular degeneration goggles from the front desk for use within the galleries. For more information about each artist and work, please see below. 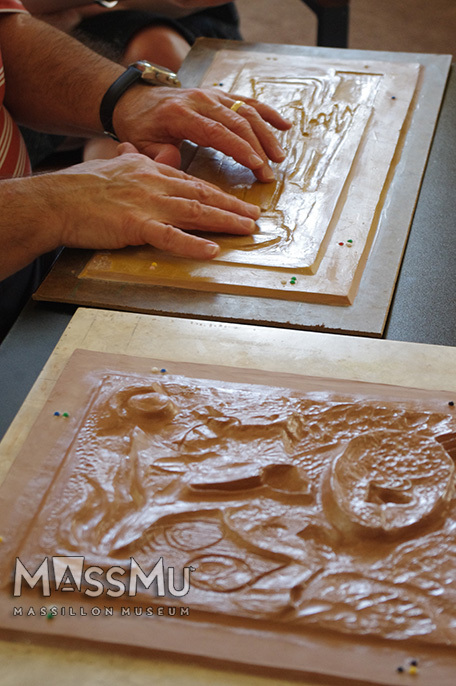 Guides to the braille alphabet are available for download here, or onsite at the Massillon Museum. Visitor surveys are available at the conclusion of the exhibition, and Museum volunteers at the front desk are available to assist with completing these surveys. The Massillon Museum thanks our sponsors for support of this exhibition: ArtsinStark, Ohio Arts Council, MCTV, Clovernook Center for the Blind and Visually Impaired, Bates Printing, Inc, Bonnie’s Engravers Gallery and Signs, Cyrus Custom Framing, Farmers National Bank, Massillon Development Foundation, Massillon WestStark Chamber of Commerce, The Dell Group, Yund’s Carwash, Western Reserve PBS, Classic Interactions LLC, the Philomatheon Society of the Blind, Fred’s Carpets, the Canton Symphony Orchestra, the Cleveland Institute of Music, and the State Library of Ohio Talking Book Program. We also extend thanks to the following individuals: Mark Andres, Brent Boyd, Erin Byrne, Alex Cooke, Charlotte Fabe, Heather Fitzpatrick, Samuel Foulkes, Saul Garza, Bob Haden, Caroline Hill, Sherri Hornbrook, Jon Keppel, Kevin Lahm, John Luchin, Stacy Luchin, David McDowell, David Miller, Mark Pitocco, Shane Reiss, Dale Ritchey, Samantha Rohrer, Valerie Sobel, Stephanie Span, Barry Stirbens, Jan Stirbens, Emery Thoenen, Spencer Thomakos, Joseph Tolonen, Margy Vogt, Tom Wachunas, Gail Wetherell-Sack, and Claire Williams, and Qingye Wu. Earth Four is the title of an oil painting on canvas, created in 1968 by the American artist David Appleman, who was born in Mansfield, Ohio, in 1943. The dimensions of this painting are 20 inches wide by 30 inches tall. 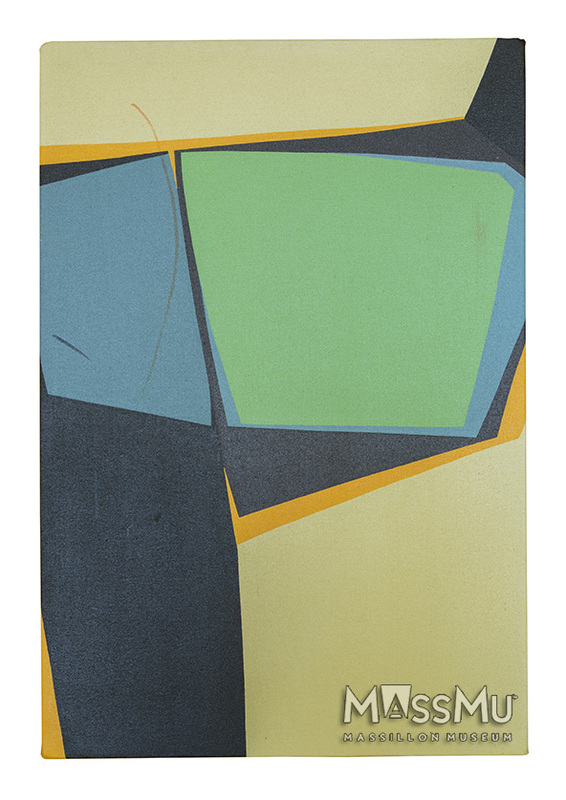 Within this vertically-oriented painting are geometric four- and five-sided shapes of different colors, predominantly green, blue, and black on an off-white background. Approximately one-third of the composition is the blank, off-white background, broken up into two sections, one at the top, and one at the bottom. In addition to the large shapes, there are pops of bright orange, acting as a border around the darker shapes. Black shapes in the painting vary slightly in tone, suggesting three-dimensionality in certain areas. Top Left: Photo Picture is a ceramic response artwork created by Nancy Blizzard in 2017. Bottom Left: Mood Scale is a ceramic response artwork created by Michael Kelley in 2017. Above: The Love Exhibit is a ceramic response artwork created by Joe Maximus in 2017. Celebration is an oil and wax painting on gesso, created in 1969, by American artist Richard Florsheim. 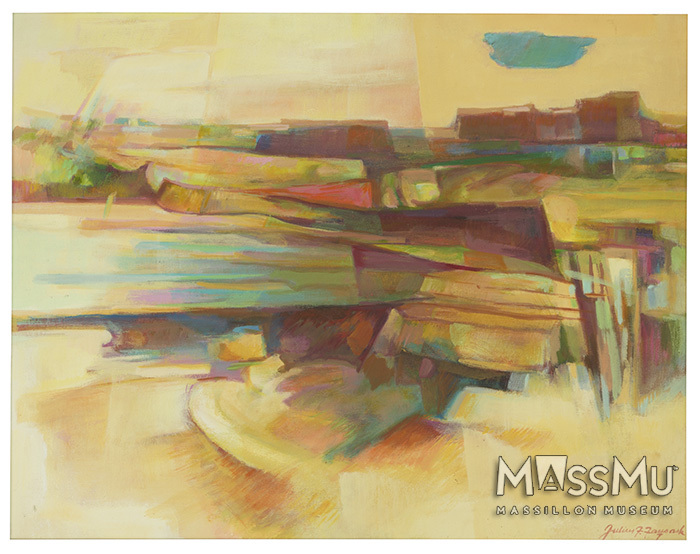 The dimensions of this abstract landscape painting are 6 inches wide by 18 inches tall. The painting depicts a blue and green sky consuming most of the length. Celebration shows fireworks over water at night. There are three bursts of bright orange and yellow forms filling the dark night sky. Aside from those bursts of color, and more muddled oranges and reds at the bottom of the painting, it is composed entirely of dark blues and black. The bottom quarter of the painting is quite hazy, suggesting the fireworks are over water. It is unclear where exactly the horizon is, as the sky and water blend together. Top Left: Reminiscing is a ceramic response artwork created by Connie Booher in 2017. Bottom Left: Reminiscing Too is a ceramic response artwork created by Ingrid Hillworth in 2017. Above: The Memory Maker is a ceramic response artwork created by Sharon Garland in 2017. 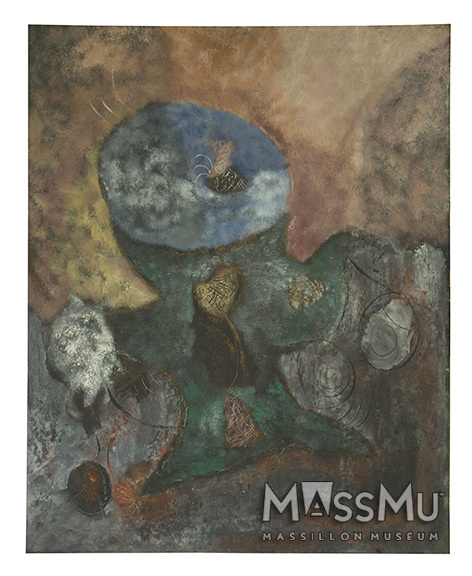 Ancestral Spectre is an oil painting on composition board, created in 1950 by the Greek-American artist Theodoros Stamos. The dimensions of the painting are 23 ½ inches wide by 29 ½ inches tall. Ancestral Spectre resembles a human body. The form is comprised of a large oval shape at the top, which looks like a head. All of the colors in the painting are muted earth tones; it looks as though a sponge was used to apply some of the color because of how they disperse. At the top of the painting, the background is a mix of oranges and reds, with diffused black at the edges. As one moves downward, the colors become much darker and the bottom right corner is almost completely black. Stamos used sharp, pencil-like marks in several areas, contrasting from the haziness of most shapes in the painting. Louisiana Train Track is a response artwork created by Lisa Hall in 2017. Gourd Head is a mixed media painting created in 2000 by the American painter Sherri Hornbrook, who lives in Navarre, Ohio. The dimensions of the large-scale painting are 66 inches wide by 72 ½ inches tall; it is one in a series of six. 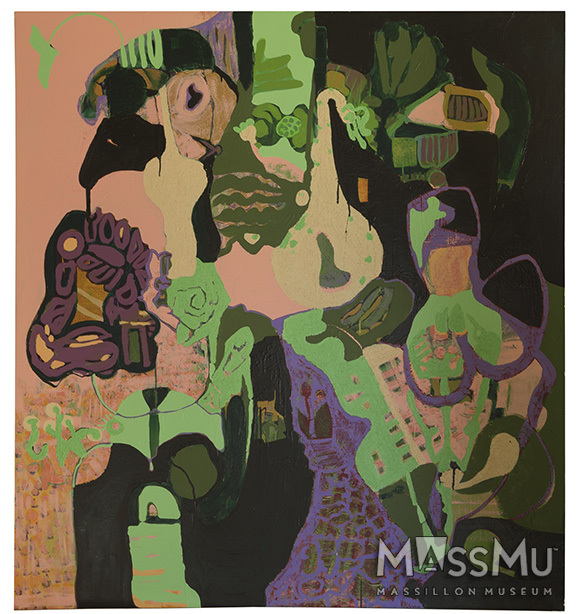 Gourd Head is an abstract painting made up of greens, light violets, magenta, and black interlocking shapes. Fitting of the name, there are several bulbous, gourd-like shapes in the painting, but they are not necessarily the focus here. The artwork was inspired by the incessant fertility of gourds in Hornbrook’s garden, and the painting reflects this in its veritable medley of shapes, teeming with life. Overall, the painting has myriad abstract, organic shapes with little to no corners or sharp edges. The left half of the painting appears somewhat brighter because its background is mostly a bright, light pink, while the right half is darker because its background is mostly black. Mystery King is a ceramic response artwork created by Kim Mceachirn in 2017. Normandale Afternoon is an oil painting on canvas, created in 1963, by the American artist Leo Thomas Kissell, who was born in Columbiana, Ohio, in 1923. The dimensions of the painting are 18 inches wide by 24 inches tall. Normandale, the namesake of this painting, is a coastal city in Canada. The simplest way to describe this painting is that it is a large, vertically-oriented rectangle, within which are two large, blue sections which take up about half the painting. It resembles a window with two panes. The two main blue sections are different tones, separated by a line of muddled blues and greens that runs horizontally across the middle of the painting. The rest of the painting, stretching across the entire left and bottom edges, is made up of various colors in abstract shapes, including purples, reds, greens, and blacks. Top: Different Texture is a ceramic response artwork created by Tammy Smith in 2017. Bottom: Art Tools is a ceramic response artwork created by Dana Metcalf in 2017. Camelot is a multimedia painting, created in 1970, by the American artist Clare Ferriter, who was born in 1909 in Boone, Iowa. She was influenced by Italian Renaissance painting techniques using egg tempera, along with paper-thin sheets of gold called gold leaf. She was also inspired by the early-twentieth century artist, Vassily Kandinsky, who believed that abstract shapes and colors could be used to express spiritual ideas. 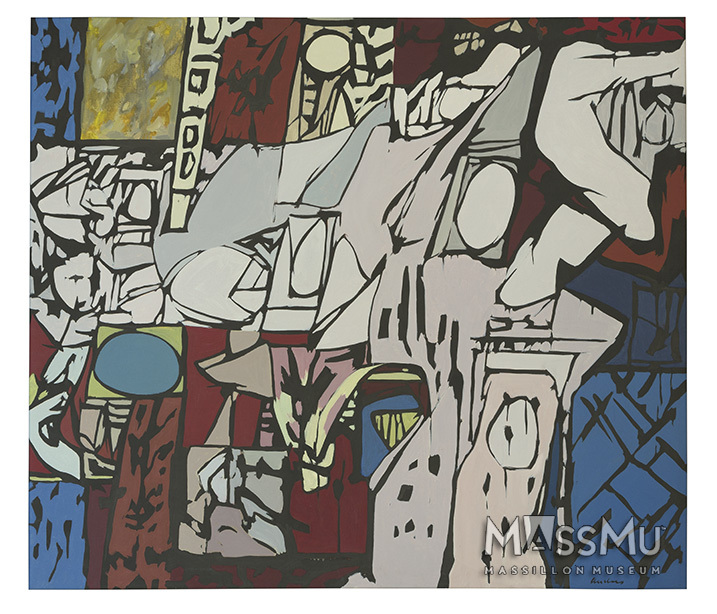 The dimensions of this large-scale artwork are 59 ½ inches wide by 47 ½ inches tall. It is part of Ferriter’s series called “Metallics,” because of its use of reflective gold and metallic leaf. Her “metallics” are considered to represent the peak of her artistic career. The composition includes a background of overlapping rectangles in various shades of gold and bronze in the Italian Renaissance style. In front of these overlapping rectangles are oval shapes. A sequence of deep red and brown ovals stretch vertically and horizontally along the left and top edges of the canvas like strands of beads. Other ovals are scattered throughout the composition, mostly in the upper right corner. The largest, most subtle oval is vertically oriented to the left of the composition’s center, filling roughly two-thirds of the height of the painting. Musicscape is a ceramic response artwork created by David Grimes in 2017. Carnival IV is an oil painting on canvas, created in 1969, by the American artist Richard Andres from Hudson, Ohio. The dimensions of this artwork are 47 ½ inches wide by 41 ½ inches tall. Carnival IV can best be described as a large rectangle, almost square, filled with abstract objects; there is not a clear background, but rather a dense grouping of abstract shapes of different colors. The shapes are, for the most part, separated by black borders. The dominant color in the painting is off-white, with undertones ranging from blue to red. The other colors in the painting are primary: red, yellow, and blue, all of varying tones. While there are no clearly defined objects, there are some jumbled shapes that seem to mimic parts of the human body. The painting as a whole suggests a great deal of movement, with many of its shapes seeming to shift toward the right edge of the canvas. The Barking Tree is a ceramic response artwork created by Deb Strader in 2017. Shoreline is an oil painting on canvas created by the Hungarian-American artist Julius Faysash in 1970. The dimensions of this artwork are 29 inches wide by 23 ½ inches tall. This painting is comprised of multicolored areas that suggest a landscape, possibly a painted desert ravine. The background is a light shade of yellow. A vertical zigzag shape in the colors purple, red, and blue weaves through the center of the composition. This shape suggests an opening in the earth, as though the ground were cracking open. The darker colors suggest depth and shadow. Overall, it is difficult to distinguish between the sky, ground, and the opening. Often an artist will use bright colors to suggest an area of a landscape that is closer to the viewer in space, and dull colors to suggest an area of a landscape further away. Here, the artist breaks those rules throughout the painting. Bright colors are used equally in areas of the landscape that are near and far, causing a disorienting flattening of the space. Ruffles have Ridges is a ceramic response artwork created by Melissa Hoppe in 2017. 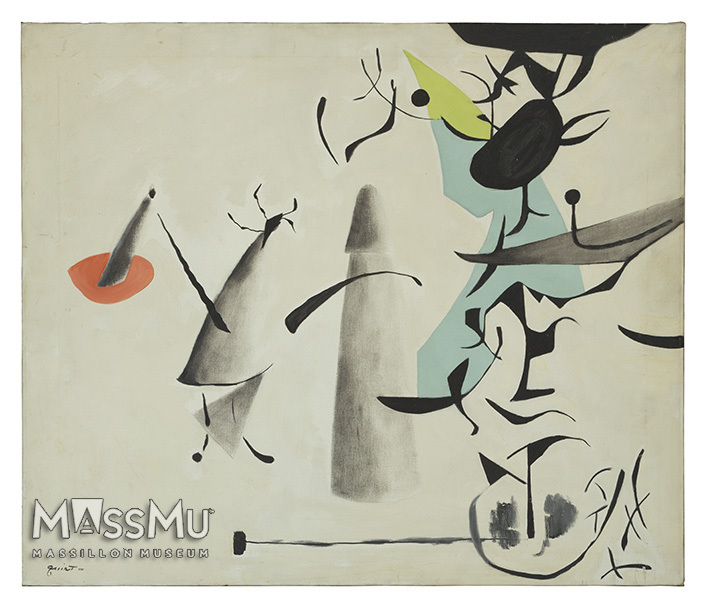 Abstraction is an oil painting on canvas created in 1952 by the American artist Walter Quirt, the first American artist to experiment with Surrealism. The dimensions of this artwork are 30 inches wide by 25 ¾ inches tall. This painting is a large, light brown rectangle with shapes and lines that resemble a landscape. Some shapes suggest people, or elements of nature such as trees. Most of the shapes and lines are very dark; several cones are darkened to a color value someplace between the light brown of the background and the dark lines. These cone-like shapes are shaded to suggest that they are three-dimensional. There are only three bright-colored areas of the painting which are very flat and do not suggest three-dimensionality. The Icy Road is a ceramic response artwork created by Terry Strader in 2017. Phoenix is an oil painting on canvas, framed in natural wood, created in 1952 by the Greek-American artist Theodoros Stamos. A phoenix, the namesake of this painting, is a mythological creature that rises to life again from the ashes. The dimensions of the painting are 54 inches wide by 18 inches tall. Phoenix is a gestural, action painting made up of navy blue, and several pops of a vibrant golden yellow on a white background; the navy and yellow seem to bleed into portions of the white, mixing to create different tones in the background. The shapes are created with large brushstrokes, mostly traveling across the painting horizontally, creating geometric shapes that do not seem to have been consciously produced, and wander freely across the canvas. Florida Thunderstorm is a ceramic response artwork created by Ryan Miller in 2017. 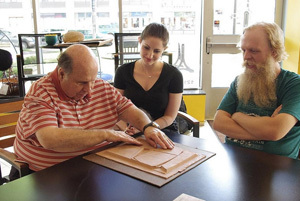 Massillon Museum's new exhibition showcases 10 abstract paintings for the visually impaired to experience. Special performance by the Canton Symphony Orchestra, featured three original compositions by Cleveland Institute of Music students in response to artworks in the Blind Spot: A Matter of Perception exhibition. Please refrain from recording the performance while in session. The Canton Symphony Orchestra will perform this concert again on Saturday, September 19, 2017, at the Zimmermann Symphony Center. Stay tuned for further details! 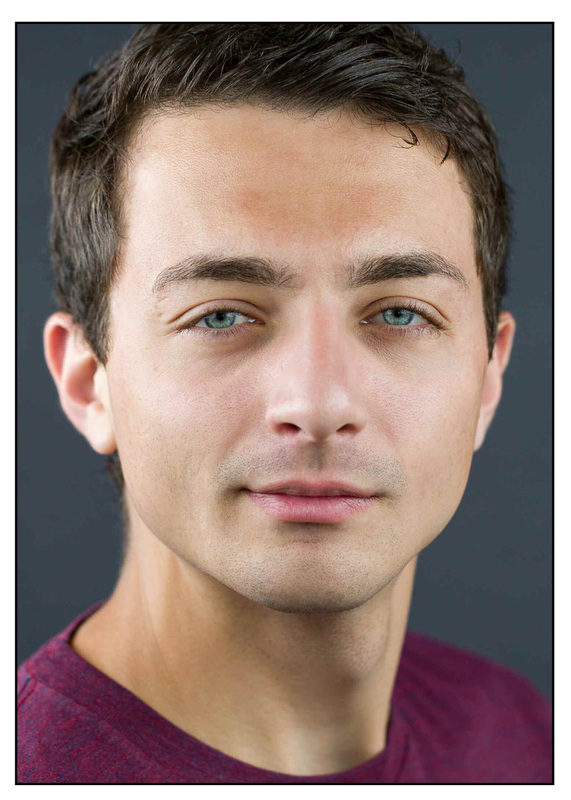 Joseph Tolonen won the 2015 Carl E. Baldassarre Composer-Performer Competition and the 2015 Hope and Stanley Adelstein Prize for Excellence in Composition and Performance at the Cleveland Institute of Music. 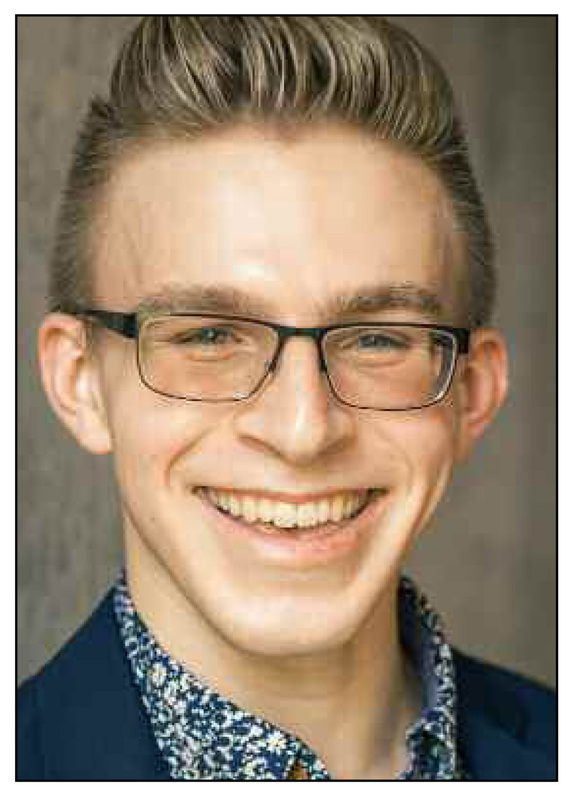 He won third place in the Third Annual Collegiate Cleveland Composer’s Guild Competition, and has had pieces performed by the Cleveland Composer’s Guild. Proficient in oboe and piano, Tolonen was part of the Cleveland Orchestra Youth Orchestra, and continues to play in chamber ensembles. He is pursuing a BM in composition with a secondary concentration in piano. Tolonen’s composition for Blind Spot is based on Walter Quirt, Abstraction, 1952. 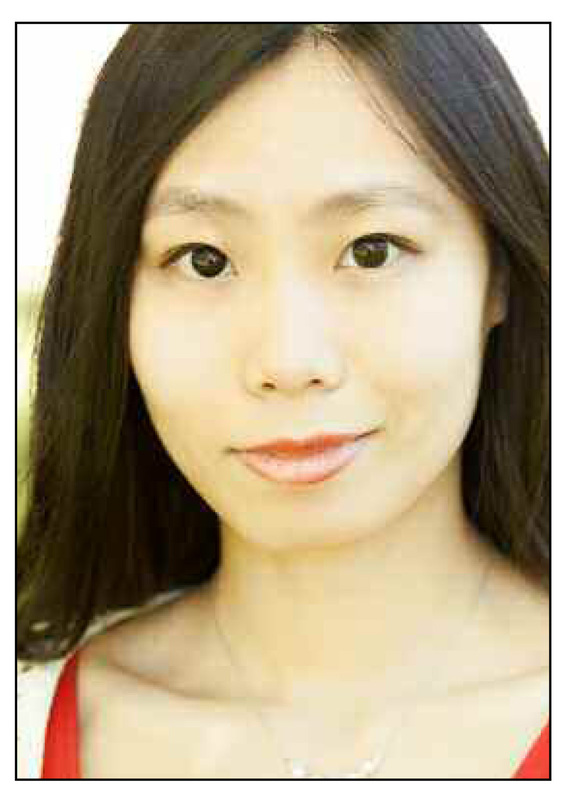 Qingye Wu, born in China, began to study piano and the Chinese national instrument, Erhu, when she was four years old. In 2009, her work, Xiao·Xing for qudi, pipa, and cello, won the award of “Good Works” in the “Confucius ode” national composition competition. Her work, Light·Continuation for flute and piano, was published in Musical Works, No.1, 2013. In 2015, she was commissioned by The Cleveland Orchestra’s Mary Kay Fink for the piccolo, violin, and piano trio, Where Is My Sky? 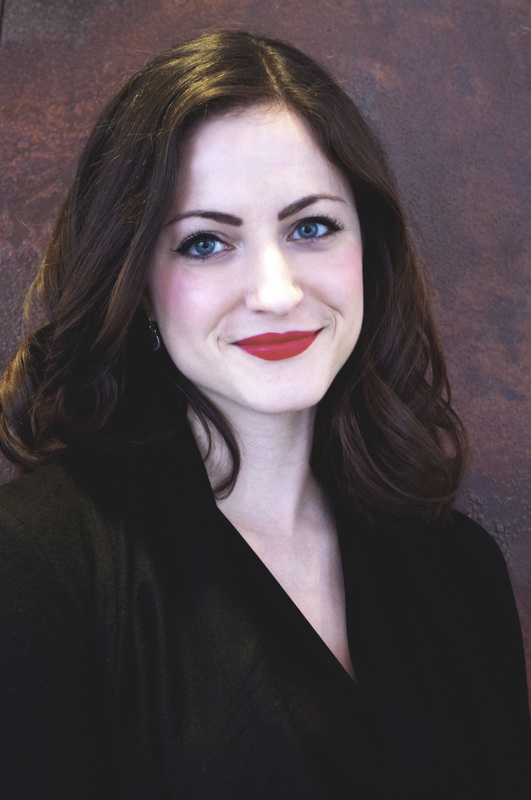 Alex Cooke is a doctoral student at the Cleveland Institute of Music in composition and a doctoral student in applied mathematics at Case Western Reserve University. 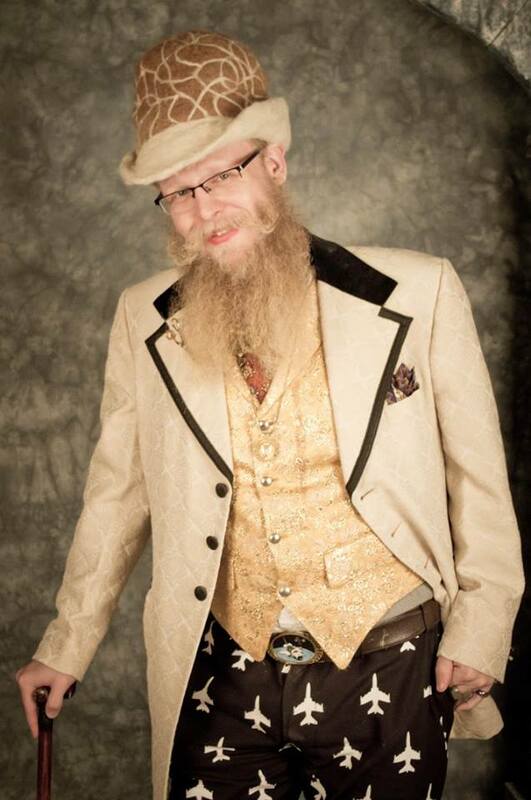 He has served on the faculty of both institutions. Cooke is the music director for R.E.D. Dance Company, editor and senior writer for Fstoppers, a published photographer, an avid equestrian, an aviation enthusiast, and a competitive runner. 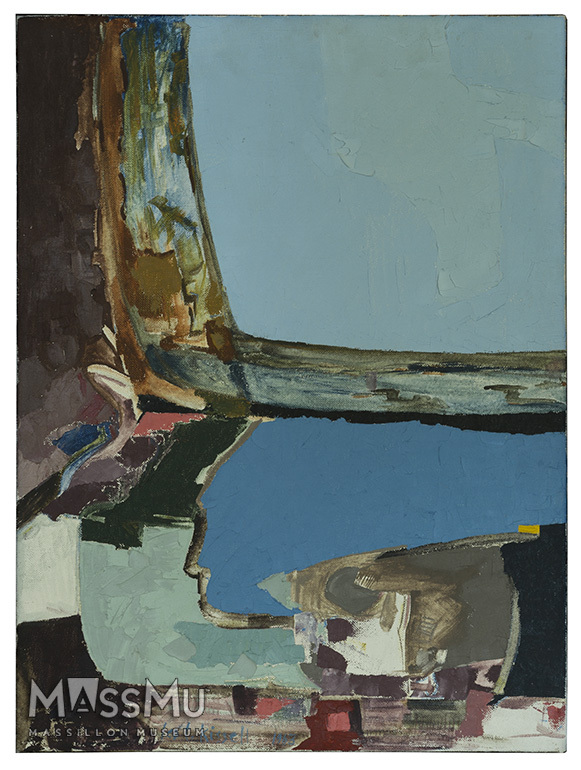 His composition was inspired by Richard Florsheim’s 1969 Celebration, an oil and wax painting on gesso. Fellowship students. Admission is free. 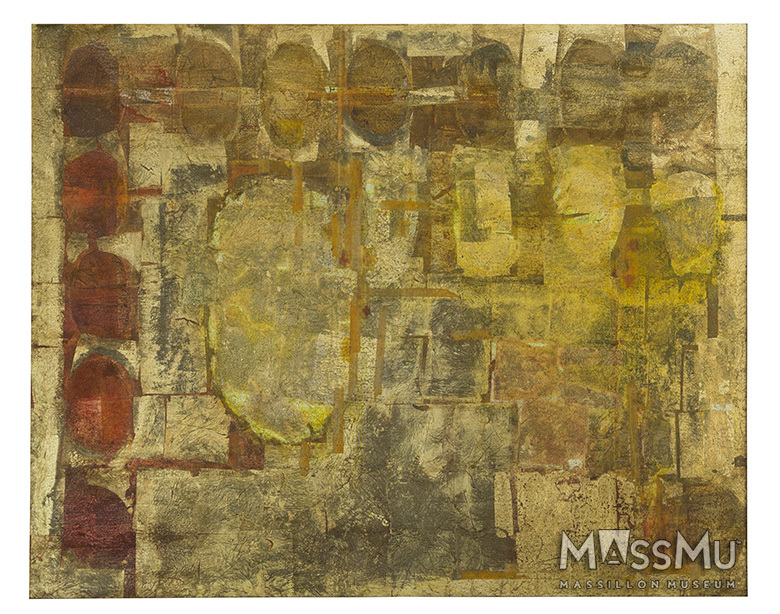 on the Massillon Museumʼs abstract painting collection. is free, but pre-registration is required. Space is limited. participants will “paint” their photographic subjects with flashlight beams. Ask Heather Haden about how you can bring this exhibit to your gallery or museum!